Vijayawada City is gearing up for the nine day long festival Sri Rama Navami which will commence from Friday. All the markets are geared up with busy activates of people to celebrate the festival on a grand note. All the major centers of the city are decorated with pandals and are illuminated with festival look. 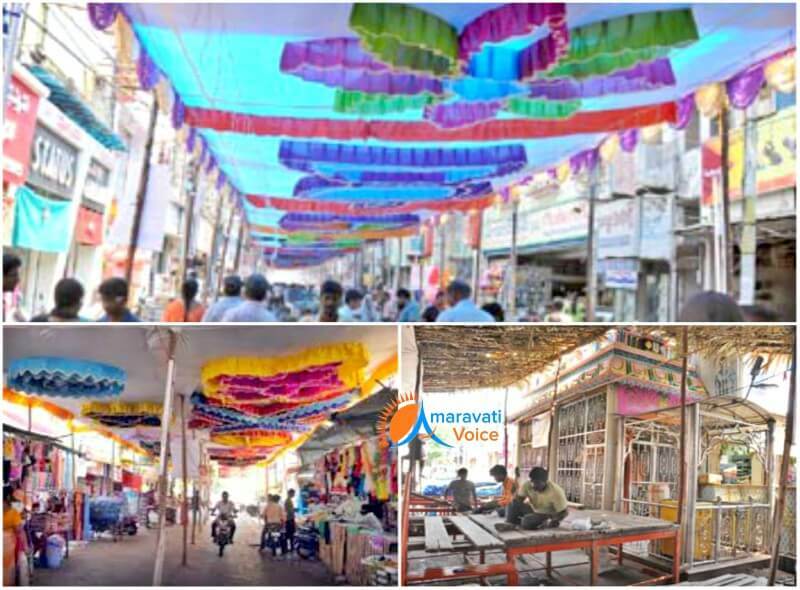 The Lord Rama Temples at Patamata, Krishnalanka, Ranigarithota, Poornandampeta, Ayodhya Nagar, Veterinary colony, Singh Nagar and Bhavanipuram have been geared up for the festival. Rama Navami, the nine-day long festival which will commence on Friday, temples and markets are abuzz with activity for celebrating Sri Rama Navami on a grand note. Major junctions are decorated and illuminated with a festive look. Organizers have put up huge pandals for the festival at colonies and on prime locations in the city. The prominent ones being the pandals erected on Besant Road, Benz Circle and One Town. The festivities will begin at 9 a.m. and the celestial wedding will be held at 10.30 a.m. ‘Mutyala Talambralu’ will be held at noon.